RECIPE UPDATED! I made some changes and they’re even better, now! Go make these, QUICK! For the South Plains Fair this year, I decided to enter the cinnamon roll category, if for no other reason than to de-throne my friend, Rod from his previous win in the category. A little healthy rivalry makes everything more fun and I KNOW his are amazing. But in the night, right before drifting off, I came up with what I figured would be a wonderful way to make the filling for the cinnamon rolls and the icing. The dough, I figured, could be altered to fit in with the rest. So I got kind of excited to embark on the process and after killing the yeast in my dough from boiling hot butter in the first round, I ended up with a good second batch of dough and proceeded with the plan! I think the secret to anything truly delicious in a baked good is butter. And I figure everyone knows, but in case you don’t, browned butter is the goodness of butter x 1,000,000. So at every turn, I turned the butter into browned butter and I formed a paste with the filling instead of doing the traditional method of smearing on a lot of butter and then dumping sugar and cinnamon, which, when rolled up and cut, inevitably dumps out a little on your cutting board. The paste. was. genius. I’m not even going to act humble about this. I browned the butter with two vanilla beans that were split (holy mother that was a great smell) and once browned, I combined the sugar and a little less cinnamon than the original recipe called for and formed this amazing smelling liquid that I let firm up in the fridge a bit so that it would harden up enough to be spread like jam instead of being liquid. It made the filling so incredibly easy to get perfectly uniform so that each cinnamon roll had exactly the same amount of filling. And then…The Icing. I’m definitely not one of those people who says something is “too sweet” when it comes to desserts. Desserts are supposed to be sweet. However, the traditional powdered sugar and milk icings for cinnamon rolls can be just SUGAR and nothing else and I thought a cream cheese icing would be too strong a flavor for the delicate brown butter and vanilla beans. So I used heavy cream, milk, powdered sugar, vanilla bean paste (so it would be pretty and flecked) and THEN I gradually added tiny pinches of kosher salt and stirred after each addition, until the edge of the sweetness was taken off and it was perfect. I will henceforth salt all my icings. Just a bit – it MATTERS! I was amazed at how good these turned out and…. TA-DA! Blue Ribbon! I was quite giddy! And then sad, because my husbands absolutely perfect bread didn’t place and my thoughts were that it was too sophisticated and the fair is a veritable sugar bomb. I think it just depends on what you respect when it comes to traditional bread, and Matt is a purest. 4 or 5 ingredients at the most. This guy is the most amazing baker I know! Anyone can make a good bread if it’s slathered in sugar and butter, but only a true baker can make a bread SING with only 4 ingredients. 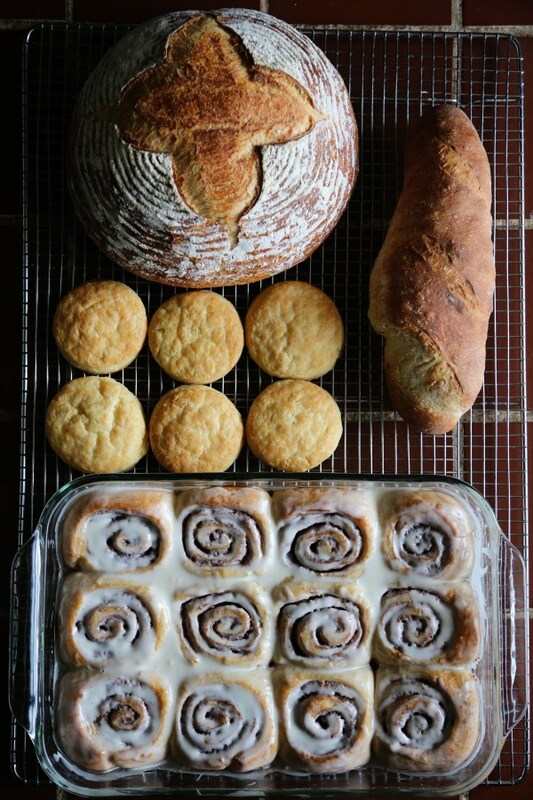 These were our submissions – Matt submitted his biscuits, baguette and traditional boule. All perfect and the best I’ve tried, but sometimes in a sea of bundt cakes and chocolate sugar loaves, plain bread doesn’t get noticed. A shame, really. Make your Filling first! Brown the butter in a large, stainless steel skillet (non stick you can’t see the butter browning) with the split vanilla beans, mushing them around as they warm up to release their seeds. Once browned, remove from heat and stir in your sugar until fully incorporated. Then add in the cinnamon, stirring to combine. You can do this a day in advance – you want this paste to be slightly firmed up so put it in the fridge and stir it once in a while until it’s the consistency of wet sand. For the dough: brown your butter on the stove by swirling it around in the pan over medium heat until solids begin to form at the bottom and it’s giving off a nutty aroma. Remove from heat and place in a medium bowl and let it cool for a few minutes. Once cooled (about 5 minutes), add the milk, the egg yolks and vanilla paste. Whisk to combine. Then whisk in the yeast. Whisk the flour, sugar and salt in the bowl of a stand mixer. Make a well in the center and pour in the milk mixture. Mix on low speed with a dough hook until thick and slightly sticky. Knead on medium speed until the dough gathers around the hook, adding up to 2 more tablespoons of flour to get a nice, smooth texture. Don’t beat it to death. Remove the dough and shape into a ball. Butter the mixing bowl and return the dough to the bowl, turning to coat in the butter. Cover with a towel and put it in a warmish place (like on your dryer) for a couple hours until doubled in size. This is a pretty slow-rising dough. Don’t lose hope. Roll out the dough on a floured work surface to a shape of about 10″ x 16″ (about 1/4″ thick all around). Now comes the fun part! Spread your filling all over the dough with an offset spatula until completely covered, leaving about 1/4″ all around clean for ease of rolling up the dough. Starting on the long side, roll the dough up tight and then slice about 1.5″ slices and arrange them on a buttered, double lined rimmed baking sheet (if you don’t have one, you can always stack pans together to form a double wall) and cover with loose plastic wrap and set in that same warm place to rise about an hour until doubled. Preheat the oven to 325 and bake about 30 minutes, until golden brown (mine were done in about 28 min). Cool in the pan 15 minutes. Meanwhile, make the icing by adding the cream to the sugar in a bowl and whisking till smooth. Then add the vanilla and milk until a nice, smooth texture is achieved. Then, little by little, tasting along the way, add pinches of salt till it tastes right. I can’t really tell you how much I added. Probably two and a half pinches! Stir till fully incorporated and pour over the rolls! This entry was posted in Baked Goods, Breads, Breakfast, Butter, Cooking Tips, Desserts, Easter Weekend, Hearty, Snacks, Uncategorized. Bookmark the permalink. Matt’s bread is surely delicious and a work of art to admire. The wholesome goodness of its fragrance stays with a person. 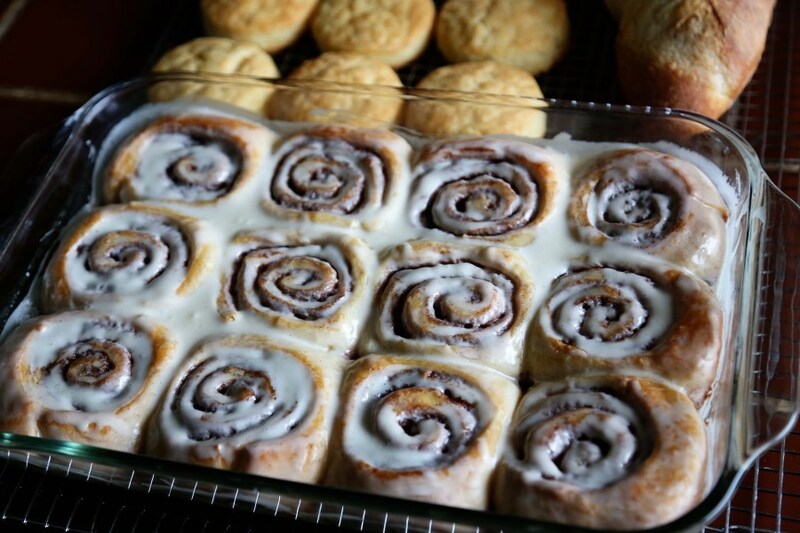 These cinnamon rolls are a masterpiece. Congrats to both of you! Congratulations! True genious is rarely appreciated Matt. Sometimes the simplicity of a masterpiece can only be understood by a true afficionado with a discerning palette. We saw a photo of the judges and I’m confident they all have much more experience than me. I’m sure they chose well – we certainly know they had a fine palette from the cinnamon rolls they picked!